It's not often that a product comes along that is both surprising and exciting. Every year, you'll see one or two things that will impress you with technical prowess or that have special cool factor which might get the blood going, but they so rarely come in the same small package. It's refreshing when it happens. The Gremlin by MusicGremlin is one of those devices. First off, the Gremlin kind of snuck up on us. We got an email last week asking us if we'd like to look at it, they sent one yesterday, and today I'm allowed to write about it. I've spent a few hours with the device, which is an 8GB flash player with built-in WiFi, but I was initially quite skeptical. After all, we've looked at Wi-Fi-enabled music players before and have rarely, if ever, been impressed by anything we saw. Thankfully, the Gremlin doesn't feel like a Wi-Fi device. When you turn it on, it automatically hunts for open networks or paid networks that you have previously authorized the device to join. The devices we received already had T-Mobile accounts, so they were essentially wireless all over the world. The device holds over 2 million song titles—I'm trying to confirm, but I believe they're using Real/MusicNet's catalog—and the devices costs $299 while the songs cost 99 cents to download or $14.99 per month for unlimited listening. Standard stuff. The one thing that makes this service stand out, however, is the playlist sharing. Every user of the MusicGremlin service appears in your "My Community" menu and you can then pick and choose songs from folks who may or may not have the same music taste. For example, I found one fellow who was in love with Queensryche while another kid really liked Joan Baez. This eclectic mix makes for quite a treasure hunt. Because there are so many songs—and because the interface is very kludgy—the community service is an excellent if not amazing feature. The song hunting interface requires you to scroll through the alphabet to type in a name, one letter at a time. Because there are so many songs, looking for someone like Bob Dylan requires lots of typing and scrolling. Unique names take considerably less time to find, but our experience has thus far been a bit frustrating. 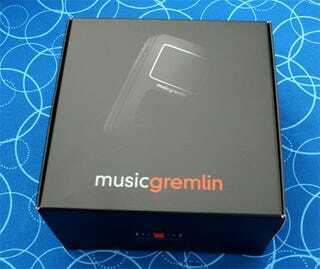 Available now on Amazon.com, the MusicGremlin should have other MP3-player makers looking over their shoulder. MusicGremlin's product is strong, compelling, and very cool.